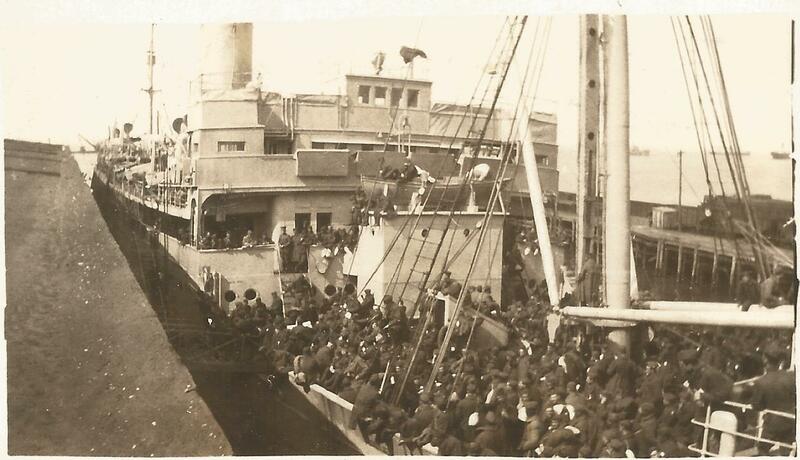 My grandfather did not remain with Battery D until they left for France on 14 June, 1918. 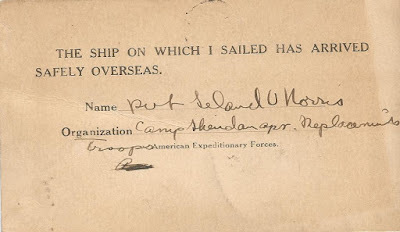 He was called to leave as part of a replacement force on 10 May, 1918 it wasn't until 22 May that his parents received the following postcard informing them of his safe arrival overseas. Somewhere on the Atlantic Ocean. Dear Parents-Just a few lines to let you know I am well, but not feeling exactly right. For today makes little over five days we have been on the water. All we see from morning till night is water, water everywhere. The sea has not made me sick, but I feel mighty weak in the knees. I miss about every other meal, and lie in my bunk most of the time. When it's rough a fellow sure has to watch his corners or he'll fall overboard. Yesterday I went to church services in the mess hall of the ship in the middle of the Atlantic ocean. I expect to be "over there" in another five days: at least I hope so, for land would look good to me wherever it would be. I suppose you will worry about me, as it will be impossible for you to hear from me very often. But you needn't worry. God will take care of me over here Just the same as in the U.S.A. It is some experience and I hope to see everything that goes with it. Hoping every one is well at home. I must close now, as it is supper time, but will write soon again. Hello again: Today is Tuesday, and still on our way. We are having pretty rough seas today, and it's just like a cradle. I have been napping a great deal of the time, but suppose we will be kept awake from now on as we are entering the submarine zone sometime tonight. We have been having fire drills three and four times a day, and now we can get out in good time, if anything should happen. We are being entertained by movies in the dining hall, and there are some Y.M.C.A. men on board, so we have plenty of writing paper. I guess I forgot to tell you we have to wear life belts all the time and also sleep in them. It surely is one wonderful trip. One beautiful sight was the high bluffs on the Hudson river. I supposed I'll have quite a job on my hands learning French. So Dwight was home again: well, tell him I will meet him in Berlin in the near future. It don't seem any farther away from home than when I was in Alabama or New Jersey, and I am on the same earth, under the same sky and under the same God, so there's no need to worry. 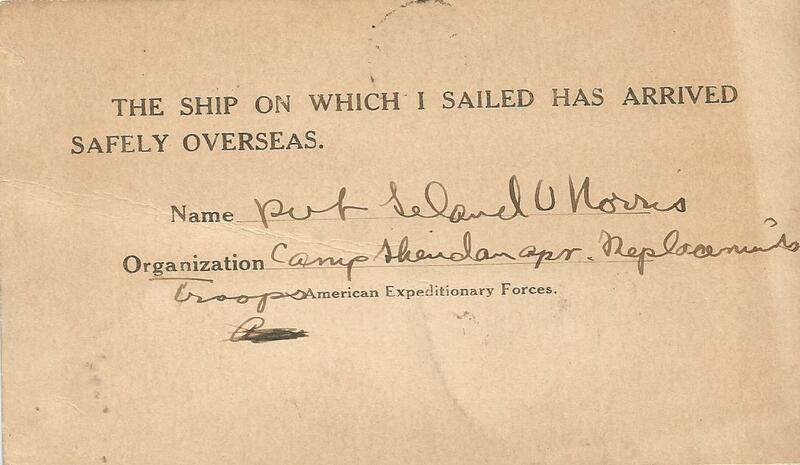 One year ago, the 18th of May, I enlisted, and by that date I will be in France, going some. Back again. Another day gone by and all is well. We are now in the submarine zone, but have not sighted any yet. 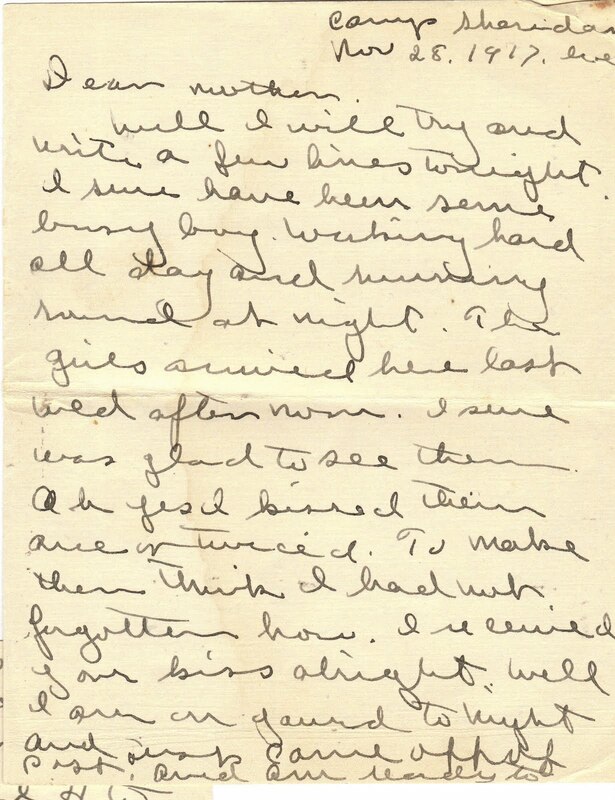 I must close for good now as we are arriving safely over sea, and am feeling fine. Give my regards to every one. With love. Well I will try and write a few lines tonight. I sure have been some busy boy. Working hard all day and running around at night. The girls arrived here last Wed afternoon. I sure was glad to see them. Ah yes I kissed them once or twiced. To make them think I had not forgotten how. I received your kiss alright. Well I am on guard tonight and (unreadable) came off of post, and am ready to hit the straw. Well, I am getting ready for our own Thanksgiving dinner. Going to have Turkey, potatoes, gravy, pie, cake, celery, cranberrys and sweet potatoes, Tomatos soup and a few more. I guess we will live high for one day at least. We boys have already received one Thanksgiving dinner. From Mabel and Vera. Tell them I thank them ever so much for it. I sure did eat. I received the money also the other stuff you sent with the girls. It sure was fine and Thanks. Well I guess you will have some dinner Thanksgiving: I guess Maggie will be there give her my best also everybody. 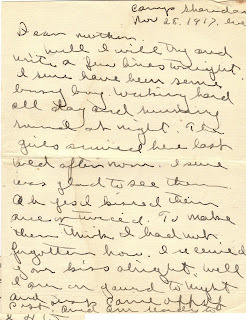 (Say Mother if grandma is taken sick in bed send me a telegram at once for I sure do want to come home and see her.) I will send my suitcase home sometime this week so keep on the lookout for it. And I guess the trunk will come next. For we boys have got our little cloth bags. Well how is the new machine. I guess you are sporting around some. Well I guess when I come home I will have some car to go see the girls in. I got a letter from Dwight. I guess they are pretty busy. I sure am some tired tonight. Will be glad when it is over with. How is Aunt and Uncle Ole? Give them my best. This is the first letter I have written in a week. That sure was some sweater Marie made me. (unreadable) Will keep it for when we get in France. Ha Ha. It sure is fine to have a home where you can go and feel at home again. I go down most every night and lay on a good soft bed and sleep a couple hours. I sure wish you could have come along. Well none of us will get home Christmas unless we have a reasonable excuse. I sure would like to be there a couple days at least. I sure wish you and papa would come down for a week or two Christmas. Mr. Hart and his wife is coming down better come along. It only costs $20 around trip now: I sure was glad to get the money. Tell grandma I wish her a happy Thanksgiving. And wish I could eat dinner with her Does she go to church with you? Give all my best and tell them I will write when I have time. Ohio State football team played down here last Sat. It sure was some game 0 to 0. Tell Paul H to write once in a while. Well wishing you all a fine Thanksgiving and would like to be there. Most close for this time. One week ago today I attended my first genealogy seminar. It was a birthday present from my husband and since I am not usually comfortable attending these types of things alone, I was a little nervous. I attached my "First Families of Montgomery County" pin on my sweater, picked up my briefcase and walked into the meeting place, knees shaking a little. As I signed in, I was happy to receive a folder filled with handouts from our speaker that would cover all four of his subjects for the day, along with many interesting product advertisements and notices regarding upcoming events. Seated with others who already knew each other well, I introduced myself and passed out a few business cards. I investigated the many "door prizes" on the table and kept my fingers crossed that I would win something, but I had my eye on that "Fold3" membership. Then, the long anticipated meeting began. Our speaker was Curt Witcher, senior manager for Special Collections at the Allen County Public Library in Fort Wayne, Indiana. What an interesting and knowledgeable speaker he is. While I enjoyed all of the sessions of the day, I have to admit the last subject was the biggest wake-up call for me. The title of this topic was This I Believe - The Urgent Need to Record Living History. Curt discussed the amount of records that are being eliminated or even destroyed by governments and public entities and how we need to become proactive in fighting to stop these practices. But, just as importantly, we need to record our own family history. Many records are no longer being kept and with social media and text messaging, the art of letter writing is quickly diminishing. I have written about this in previous blog posts and I have vowed to make it a point to continue mailing cards and letters as often as possible. But, Curt had something even bigger in mind. He challenged all of us to write 1000 word essays about our ancestors and about ourselves. What we write now may well be the only historical records our descendants have to learn about their family history. He encouraged us to write journals about our typical daily activities and we discussed as a group writing letters to our children and grandchildren as a legacy to leave behind. It was a valuable time of sharing ideas and I am grateful I was able to attend. Even though I didn't win any prizes, I took away some new and exciting information regarding research, products, and new subjects about which to write. In conclusion, let me challenge YOU to begin to write your own family history. It doesn't have to be an epic and it doesn't have to be 1000 words. Just start a little at a time and write about the family members and events you remember; your mother, your father, your grandparents. Write about favorite vacations or traditions you have on holidays. There are inexpensive journals that you can purchase at discount stores or you can type it on your computer, print it out and put it in a notebook. Even if you just write one sentence a day, start it today and make your story, your legacy. I am certainly going to try. When I first became a member on Find a Grave Website I visited celebrities pages about putting greeting flowers on their pages. Even so that I really didn't knew them in real life, but I did watch them on TV or the movies or to hear their music. I also begin to created pages for our family, and friends, and their families too. Well anyway that I have been a member for 5 years now, and last week that I received a message from another member on there. They have ask me about do I know someone name James W. Kildow, lll well of course that I did reply back to their message. It's turns out that they had recently found, and purchased a marriage license from Goodwill in Dayton, Ohio but they kept it from being destroyed. And they sent it in the mail that next day. I ask them about to owe that person for anything. Then they had said no, but they was so happy to find the right owner. I did received it yesterday, and as I was looking down at bottom of the certificate that I have notice that another Uncle name was on it. Great-Uncle Karl Kildow to give the bride and groom away to our Great-Uncle Jim. Even so that my Mom (Sarah) and my sister (Marian) and I never ever did meet him in person that I had tears in my eyes not only to have something meant so very special to my family. But a totally stranger to take the time out to care about another person. I have had several opportunities over the past few years to reunite documents with their owners or family members and I can't tell you how much joy it brings to me to be able to do so. I have written about a few of those occasions on past blog posts. I am so glad I went to the outlet store that day and I am even more happy that this certificate is where it belongs! "Once You Get Beyond Your First Cousins, It Doesn't Really Matter". 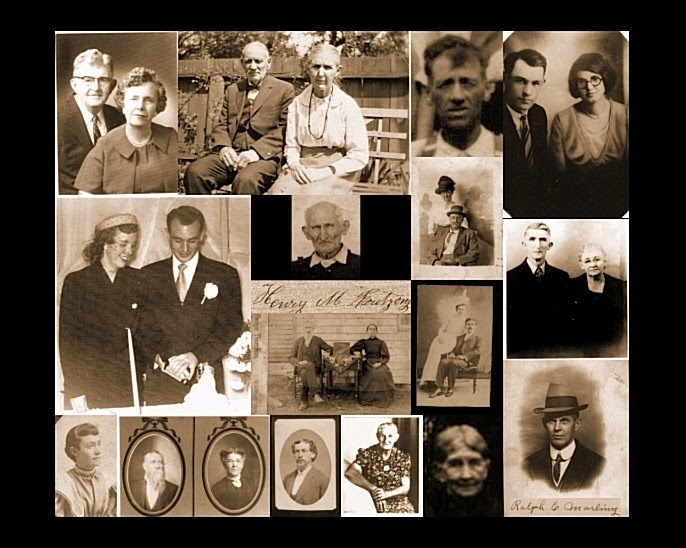 Recently it occurred to me that it was 10 years ago that I began my serious search for my family history. 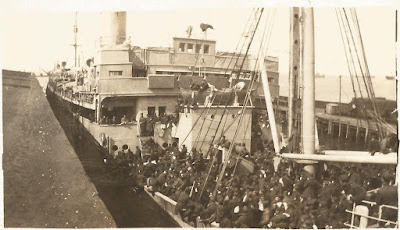 I had always been interested in my ancestry and thankfully, I came from a family of "packrats" that kept many pieces of historical documentation, photographs, and family Bibles. I had always known my great grandparents names so I had a good beginning, and as evidenced by a room full of binders and a wall covered with "First Families of...." certificates I clearly became an avid researcher of my genealogical history. My DNA is 38% Irish. Of course the Irish branch of the tree is the one that is trying to grow through that huge brick wall. I am the 5th great granddaughter of a man that was hanged for being a Tory in 1781, even though most accounts agree that he was probably not guilty. I am the 2nd cousin, 5 times removed of a good friend of Abraham Lincoln's. So good in fact that the president once spent the night in his shed because my cousin's home had burned to the ground. I am the 4th cousin, once removed of the man in whose honor Mt. Swadener is named. He was the navigator on the first plane that landed at the geographic South Pole. 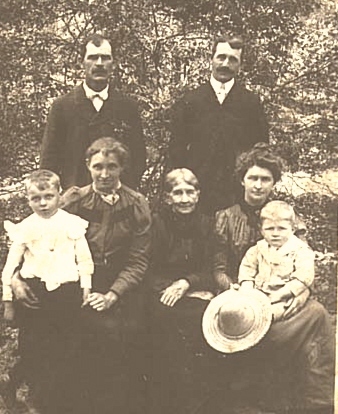 My 5th great grandfather was first settler in Union Township, Clinton County, Ohio. He arrived there in 1801 with his rifle and his horse and cleared 200 acres of land for farming before going back for his wife and six children. 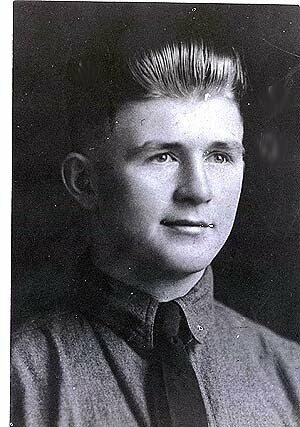 I am the descendant of at least 4 Revolutionary War Patriots, 1 Soldier of the War of 1812, 1 Civil War Veteran, a Cavalry bugler in World War I, and a Korean War B-29 Radio Operator. . I have relatives who marched through the French countryside and flew over German skies to victory in two World Wars. I also admit to having a slave owner in my ancestry, but I also proudly boast several abolitionists. I have founders of churches of numerous denominations, with a strong belief in a living God. Sadly, I have cousins who were victims of vicious crimes and also several who committed crimes of a heinous nature. In the last 10 years I have become a grandmother (twice! ), I have lost a long term job, my husband went to school and began a new career at the age of 57, AND my life has also become so much richer because I have come to know grandparents, aunts, uncles, and yes, cousins, distant though they may be, because of my love of genealogy. I have come to appreciate my place in the history of my country because of my own history. So, yes my friend, once your get beyond your first cousins, I believe it truly DOES matter. So, open up that binder, fire up the computer, and start searching! 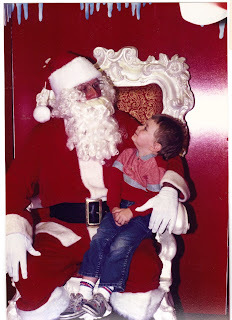 I don't remember ever going to see Santa Claus. I do remember "hearing" him walking around in the toy department of whatever store I was in and feeling very scared that he might come see me and want to talk to him. Thankfully, he didn't notice me and he went on his "merry" way to greet some other child who was going to be happy with the attention. When I had my own children I wanted to make sure they had the opportunity to share in the joy of Santa. When my oldest son was born, he was only two months old at his first Christmas, but I was determined that he was going to have his picture taken with Santa. 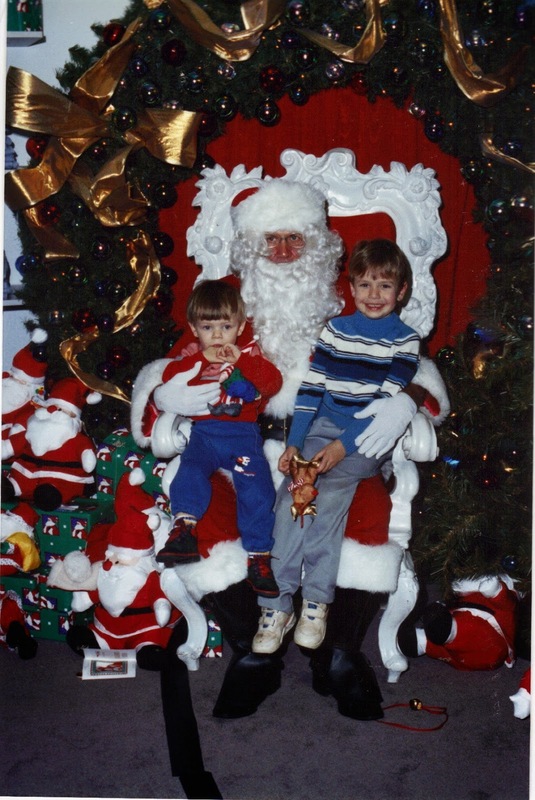 My reasoning was that if he had pictures of himself with Santa, it would be easier to get him to go visit him when he was older. So, off the three of us went to the Dayton Mall for a Santa picture. Daniel was an angel for the entire time we had to stand in line. He slept. We handed him over to Santa. He slept. He never even opened one eye during his entire visit with Santa. It made for very cute pictures though! 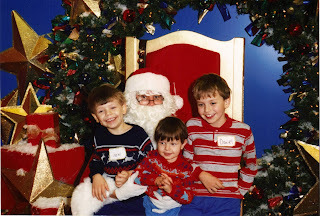 The mall was okay for the first couple of years, but I wanted a richer "Santa" experience for my boys. 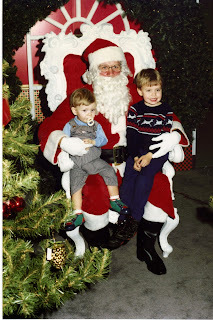 Thankfully, at the time one of Dayton's department stores held breakfast with Santa every year and on the Saturday after Thanksgiving it became our family tradition to be there. The store's restaurant was small and reservations had to be made, so it was a nice, intimate feeling occasion. Each family was seated at their own table and the breakfast was served by friendly waitresses. After breakfast, some of Santa's helpers arrived and we all did a "countdown" for Santa's arrival. In he would walk with jingle bells ringing and he would visit each and every child! After his visit, he would head for the "big Santa chair" where he would sit while all the children gathered round and one of his elves would read "Twas the Night Before Christmas". The best thing about this Santa was that he would also share the true meaning of Christmas with the children. What a joy! Then, the breakfast over, Santa would head downstairs to his "SantaLand" where he would listen to the children's Christmas lists and have pictures taken. I wouldn't trade those years for anything and I will be forever grateful to Elder Beerman's for hosting those precious breakfasts. They no longer hold those events; the store where we went has even been torn down. 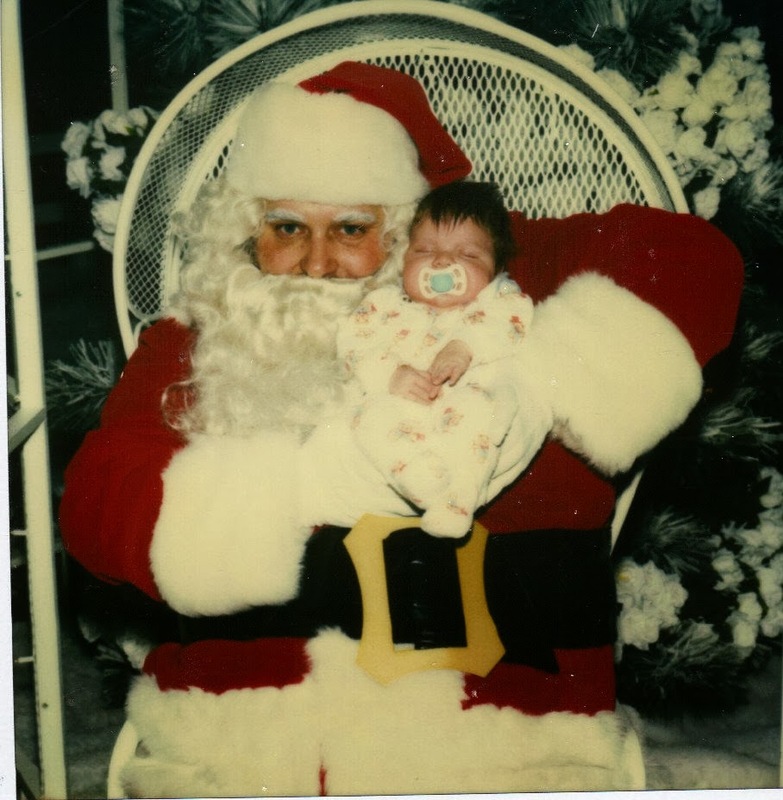 I feel very blessed that we were among those families who were able to meet Santa in such a personal way. This particular post is a "Repost" of my Christmas Food story from the 2010 Advent Calendar. Thought it would be nice to share it again. There is nothing quite like holiday foods. My earliest memories of holiday food at Christmas revolve around Christmas Eve at my uncle's home. 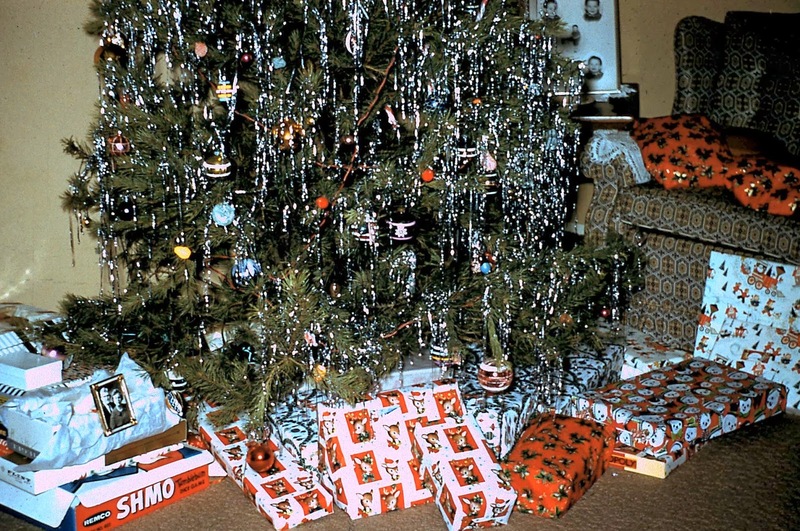 Of course, the main thing on my mind was presents and how soon we would get to open those presents. 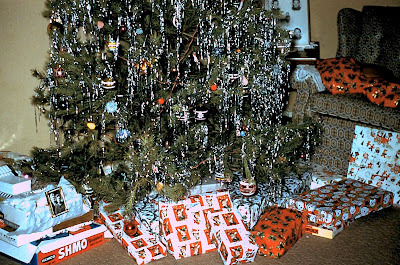 And, we wouldn't get to open the presents until after dinner. So, let's get this dinner thing over with as soon as possible. All of the kids would eat dinner at the kitchen table, while the adults would eat downstairs. Our parents would fix our plates and give us each our own bottle of Coca-Cola. After we ate the "nutritious" stuff, we could have those wonderful cookies that were sitting on the table in the dining room. My mother's side of the family was very large and we had literally "tons" of food to choose from. I don't remember specific dishes here, but I do remember how much we all loved having our own bottles of Coke. No wonder we couldn't go to sleep that night! Christmas Day was spent with my father's side of the family. All the food was wonderful, but there were several items that became staples in our holiday traditions. My aunt made a delicious dessert called Cherry Delight. It consists of a graham cracker crust, cream cheese, Dream Whipp, and cherry pie filling. I think my brother could have lived on Cherry Delight alone! She also made Divinity Fudge like I have never tasted before. My mother started making buckeyes every year and she continues to do so. We also have a cheese ball each Christmas that even my kids look forward to. We usually don't make any of these things at other times of the year, because they are so associated with Christmas that it wouldn't seem right. It may not be politically correct or even medically sound, but I think at Christmas there is nothing wrong with eating something just because it tastes so good! One of the things I look forward to during the Christmas season is turning off all the lights and watching television by Christmas tree lights. So much do I enjoy this that I have tried to think of some way that I can keep Christmas lights on in my living room all year long. There is something very peaceful and cozy about those tiny, twinkling lights. My childhood memories are of the old, big colored lights that hung on our tree and in our windows. You can see them in the picture above, hanging merrily on our Christmas tree. My brother and I would close the white living room curtains and the colored lights shining through them made a perfect backdrop as we co-hosted our Christmas "variety" shows to an audience of one thoroughly entertained border collie! We never had outside lights, but we certainly enjoyed those that hung outside our neighbor's homes. It seems each year we see fewer homes decorated for the season. I'm not sure if it is because of the cost of the lights, the electricity they use, or maybe the fact that everyone is so busy now that it is hard to find the time to build the displays. I am very grateful for those people who believe it's worth the effort they put into it to make the season even more festive! Thank you, neighbors! I usually start listening to Christmas music in September. I haven't this year, but my standard policy is that it is never too early for a good Christmas carol. Even though there are a few really good new Christmas songs, I prefer those recorded by my favorites; Bing Crosby, Frank Sinatra, Dean Martin, Barbra Streisand. The recordings made from the 1940's through the 1960's are my preference, even though I enjoy new performers like Kelly Clarkson and Michael Buble' there is just something missing from today's music. Maybe it's because memories attach themselves to the music that surrounded them and they are always there when you hear that music again. All I know for sure is that at this time of the year, hearing the mellow tones of Crosby and Sinatra gives me that "Christmas Feeling".